Coming across a fake tomb in one of the main working districts of Istanbul, I kept going back to it to unravel further the local narratives behind it and to trace the visually observable changes caused by cultural, social and politic dynamics. The neighboring shopkeeper had the initial idea to transform some found left overs from a previous building into a fake tomb to solve the problem of "the unbearable smell of urine". I documented the changes in this spot for a year in the form of photographs, daily dialogues and interviews. I transformed these documentations into collages and drawings, which were then transformed into an animation telling the story of the tomb. I worked on the text layer as a character in the animation, introducing different quotes from the interviews with the shopkeepers. It was one of these shopkeepers who had the idea to transform a cement block into a tomb to keep this neighboring place clean. The animation is a record of the dynamics at play regarding the transformation and sustainability of this spot. The text, which is actually taken from the print out from transcribed interviews, is also transformed into a visual element for the animation. 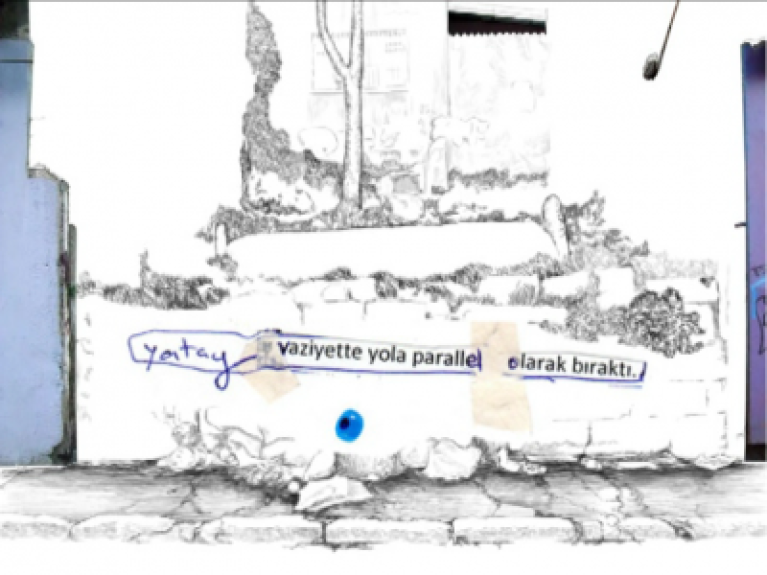 An everyday mythology of the local, this work also has another layer: A series of ironic "mani"s (a traditional Turkish quatrain form) telling the same story in the form of text. The shopkeepers keep the texts and photocopy them for those who are curious about the place. sanatçi tarafindan bir dizi mani de yazilmistir. Fotokopi olarak dagitilmaktadir.